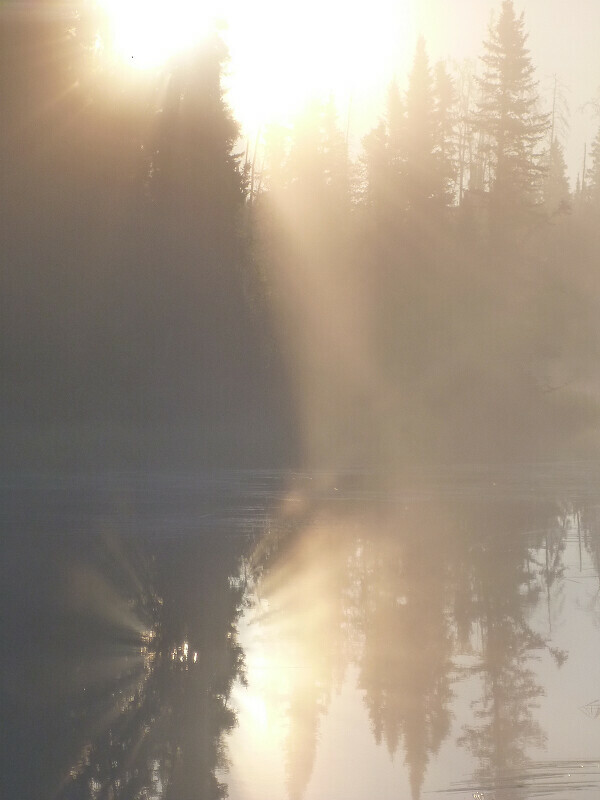 Background: A few years ago, we met a fellow paddler at the MacKay Lake Provincial Recreation Area. He had a cabin on Bartlett Lake and he mentioned meeting a local family who had come up the creek into Bartlett Lake from Nipew Lake on the Churchill River. We were intrigued and told Ric at Churchill River Canoe Outfitters about it. He was interested, too. He is always on the lookout for routes that are new to him and this one was particularly interesting because it would place the paddler on the Churchill upstream of Missinipe and upstream of the whitewater in the Barker Lake area. Nothing was done that year but next summer, Ric sent out his son, Dan and some others to have a look. They were able to work their way into Rithaler Lake and along the creek to where it went over a falls and continued steeply downward into a deep valley. They could not find a portage trail and, due to time constraints, had to leave the quest. That fall some of our paddling group camped on Bartlett Lake and, while one group cleared the portage into Thornton Lake, the other group went looking for the elusive portage. This group were able to improve the portages along the way and to identify some potential camping sites but they were unable to locate the portage before they had to return to camp. The question remained, “How was this family getting up this creek from the Churchill?” To make matters worse, the cabin owner met the family again this year (2014) and they said they came and went that way because it was the easiest way to get to the road from their cabin on Nipew Lake!!! This fall I was able to take a few days to do a trip in the Missinipe area and decided to see if I could find the trail and make it down to the Churchill. I parked at MacKay Lake (where parking has been secure), paddled approximately 6 k to the portage into Bartlett Lake. The portage to Bartlett Lake is about 500 meters long and in excellent shape. 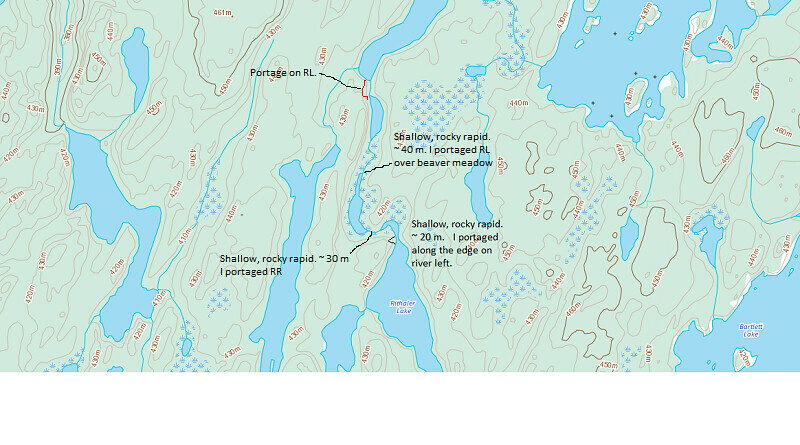 On the topo map 73P/7, the portage is incorrectly located – the MacKay landing is actually on the east side of the skinny peninsula in Urton Bay (025472). I paddled approximately 7 km on Bartlett Lake to the portage into Rithaler Lake. 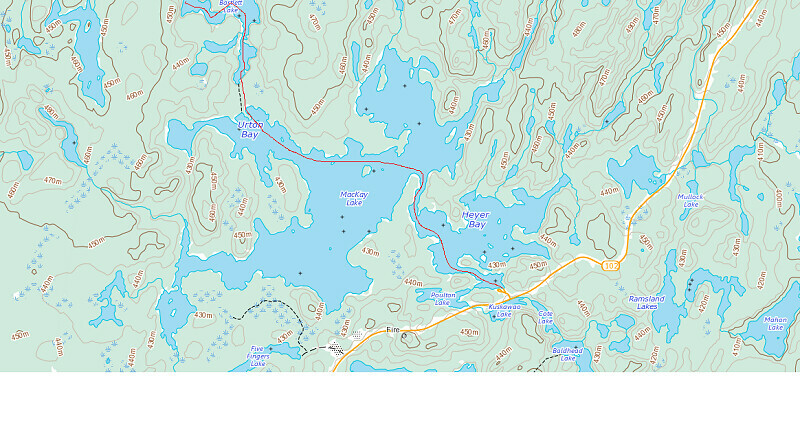 There are some potential campsites on the islands and points in the west end of Bartlett Lake just before the portage. One is on an island at 004524 – 73P/10 and another on a point at 001522 – 73P/10. The portage from Bartlett to Rithaler Lake is on the south side of the creek (995524 – 992522). 460 meters long and in generally good shape but with some areas of rough footing. There are two starting points to this portage. One starts off the small bay at the end of Bartlett Lake and the other starts on river left a few metres down the outlet creek and around a corner to the left. The second one will save you a few metres of portaging. In addition, there is an early exit from the portage as the trail approaches the creek below a shallow rocky rapid. This could be used if the creek is high enough to paddle or wade. It will potentially save 70-80 metres of portaging. I paddled along the east side of Rithaler Lake (Campsite for two tents noted on east side of Rithaler Lake (983536). This site has a lot of broken glass by the fire-pit. On my return journey, on a rainy, windy day, I had a moment of concern and doubt along this section. On the way out, there were no human structures that I could see. On my way back, with my head down with the wind and rain, I came “suddenly” upon a dock made of local trees. What?! Was I lost? There had been no dock there when I went in – had there? Was I off track and how do you get off track on a lake like Rithaler? As I drew closer to the dock, I could see it was brand new and that it had just been built. Someone had come in after I went by, built a dock and left before I came by again. An interesting moment of self-doubt. Anyway… back to the trip report. I came to the rocky shallows at the outlet of the lake 979542 – 73P/11. My friends had been able to wade this short rapid last fall but I had to do a short portage over the rocks, grass and bushes on river left. I paddled about 300 metres and came to another rocky rapid with very little water. Once again, my friends had been able to wade this last year but I had to portage on river right. 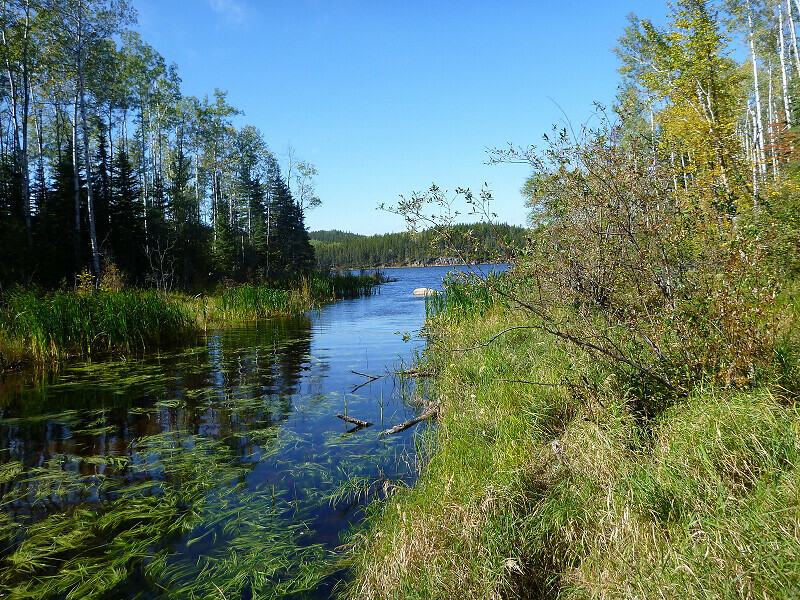 I paddled another few hundred metres and the same scene repeated itself – they had waded but I had to portage on river left over the beaver meadow grasses and bushes. The next paddling session was about 500 metres long and then I came to a beaver dam followed by a shallow, rocky rapid. The portage trail is on river left. The portage is on the west side of the creek between two small nameless lakes (974554 – 974555), 55 meters long and in good shape but rough. The trail has been cleared but there are a few holes. 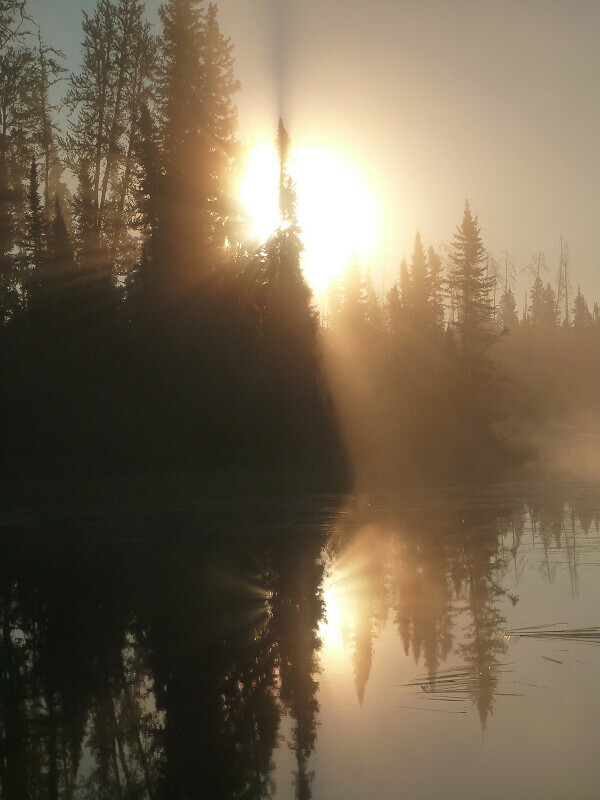 I camped at the north side of the small nameless lake at the north end of the just mentioned portage. 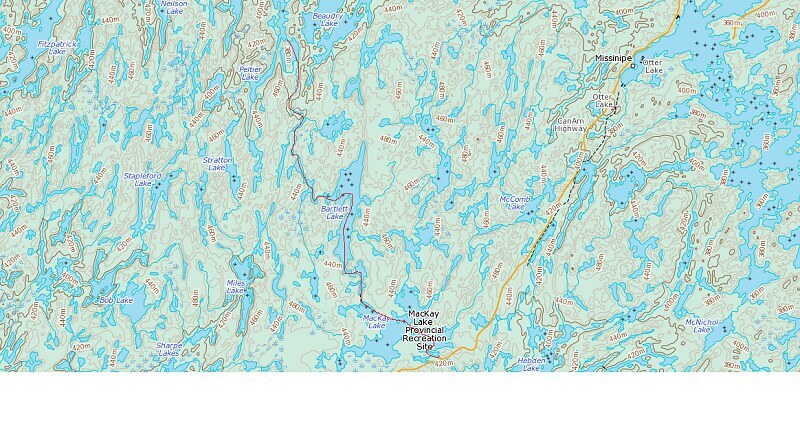 The campsite is at the start of the next portage trail which is about 20 metres east of the outflow stream and falls. This is quite a nice campsite with room for 3 or more tents, however, it is situated in an old burn with a number of standing dead trees. This campsite, in spite of the dead trees, is the best one I saw since Bartlett and the best one I saw until you reach the Churchill. I used this site as my base for the next four nights. 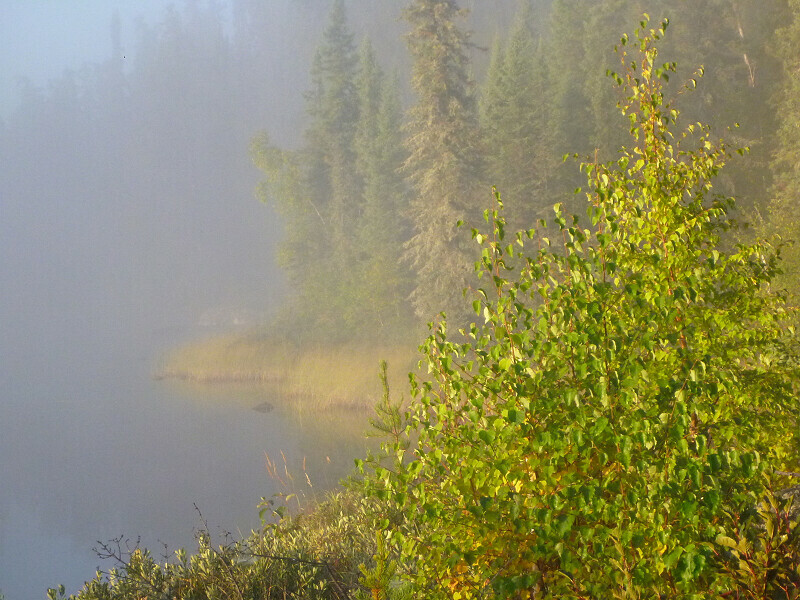 Here are a few pictures taken from the campsite one foggy morning. 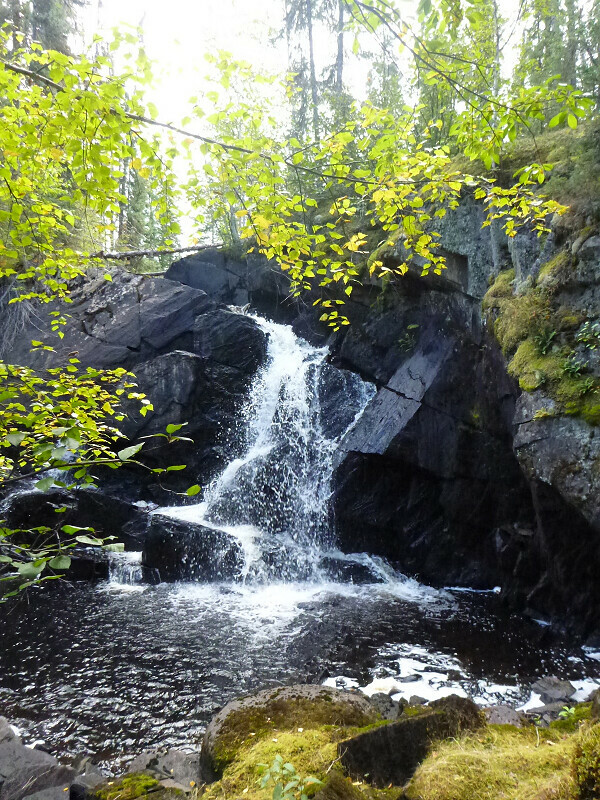 There is a falls at the outlet stream – this is the first of two falls in the next kilometer or so. Rithaler Lake is 40 metres higher than Holman Lake on the Churchill so there is a lot altitude to lose. The next falls is larger and is where the portage trail had not been found. The portage from this small nameless lake (978563) to a navigable stretch of the creek is 126 meters long and in good condition with one steep down section. The creek is then navigable for ½ kilometer. During group discussions about the possible location of the portage trail around this next section, we guessed that the trail might go the east of the large hill (973567) and so avoid the falls and following shallow, rocky rapids so I stopped at about 974565 and tramped about in the woods for about 90 minutes. If there is a trail there, I did not see it. I paddled on to the start of the next portage around a shallow rocky section of the creek. I did a portage on river right of the creek (973563). It is 64 meters long according to a GPS unit last year (it felt longer), rough and winding, camping might be possible halfway along. I then paddle 50 meters to near the falls. There was a large tree completely blocking the stream but I was able to pull out on river left and follow a short, flagged trail that allowed a viewing of the very picturesque 5 metre falls. I explored this side of the river for 30 minutes or more searching for a portage trail but found none. Just as I was about to leave, I looked at the river right side of the creek immediately above the falls and thought that the area looked a bit tramped down. Since I couldn’t paddle there because of the downed tree, I walked down the river left side and was able to cross the creek on the rocks at the top of the falls. I discovered some garbage and a trail. I followed the trail for a way and it looked quite promising so I returned to my canoe, crossed the creek and pulled it up on the river right bank. I loaded up my daypack and, armed with flagging tape, I followed the trail. I notice some old blazes and some newer axe marks and signs in the grass and bushes that people had been through there – including occasional pieces of paper towel. I have to say that if whoever came through that way was carrying a canoe, I have a great deal of admiration for their strength and perseverance. There were a number of downed trees. In places there were a few downed trees together. Their trail went right through a number of these. The trail started contouring down to the left and at one point there was quite a steep section about 8 m long. Once on the flats below the hill, the trail was flat and led through long grass and some bushes. Eventually I came out on the bank of the creek just below a field of boulders under which the creek flowed. This section was shallow but wade-able and/or paddle-able. I found some old fishing supplies here so I assumed that, even if this was not the “main” trail, it was a trail that people had used in the not-too-distant past. I decide to add additional flagging on the way back and to cut it so that ordinary people could get through with a canoe and equipment. I returned to the top, got out my chainsaw and cut the trail. When I was finished, the trail was in OK condition and it was time to go back to camp. I did not have a lot time on this trip so I needed to plan my moves with some care. I was tired after my paddle in which included 6 portages with 3 trips on each portage – one of the cons of traveling solo with a chainsaw and fuel and not being a “light” traveler in the first place. I decided to take it easy the next day and then to make a push to try to get through to the Churchill on the following day. 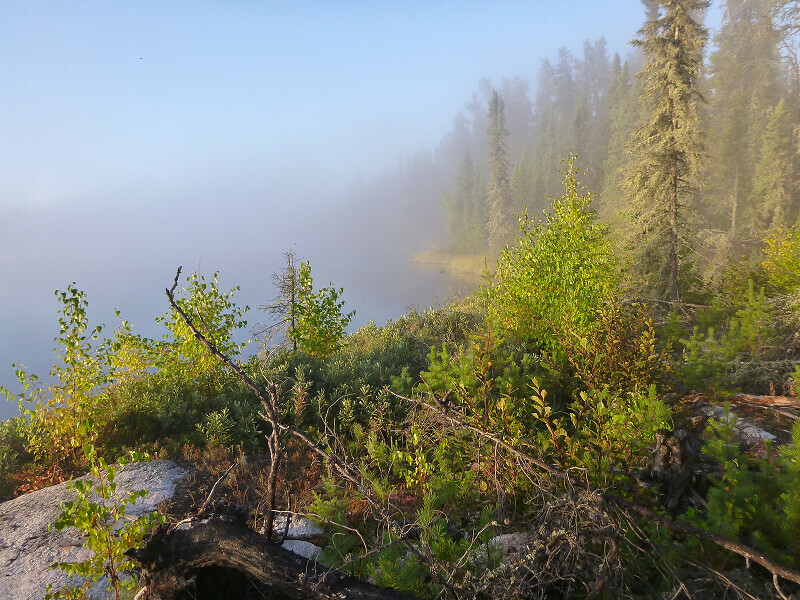 On my rest day I removed about 15 logs from the portage on which I was camped, I cleared some more tent sites and a walkway to the edge of the “campsite” falls and I went back to the last portage at the south end of the small lake and cleared it. I tried fishing for a while. I caught a number of the skinniest pike I have ever seen. The lake has no name but I nominate “Small Pike Lake”. I noticed that there were no minnows in the shallow portions so I think that life is difficult for the pike in this lake. Maybe, someday, some minnows will get established in the lake and life will get easier for the pike. A good day. The next day I was up early and decided to travel as light as possible to maximize my chances of making it through to the Churchill. With a day pack and canoe, I could do the portages in one trip. I returned to the “new” portage I had cut (approximately 350 m). It is in generally good condition with one steep downhill section and some rough sections. I arrived at the creek and was able to paddle and wade for a few hundred metres until I came to a steep, shallow, rocky rapid. I spent a considerable amount of time looking for a portage trail upstream from this rapid on both sides and, also, on both sides of the rapid itself. The only thing I found was a trail at the bottom on river right but it veered away from the creek after 75 m or so. I dismissed this trail but was not aware enough (duh!) to wonder where it went. In hindsight, I wonder if this was not the north end of the “main” trail because it would avoid the falls and rapids but also it would avoid the shallow section of creek above this rapid??? Maybe another trip is required? Not finding a trail, I was still able to drag my boat through the woods on river left and re-join the creek below the rapids. The water here was slightly deeper than the previous section so I was able to paddle and push my way forward for a few hundred meters until I encountered another steep, shallow, rocky rapid. I took a guess at river right and flagged a dragging trail through the bush then I returned and dragged my boat to below this rapid. The water here was slightly deeper again so I was able to paddle a few hundred metres until I came to another steep, shallow, rocky rapid – this is number 3 on this section, if you’re keeping count. I walked and flagged a dragging path on river right and then returned and dragged my canoe to below the rapid. The creek was deeper here and showed signs of recent beaver activity – there had been no signs of beaver activity on the upper creek from the falls on down. I was able to paddle this section. I had to drag over one beaver dam but that was easy. The meanders became a good chance to practice sweeps and cross-bow draws. After a kilometre or so I came to a small lake. I stopped for a break and snack on a small rocky point in extreme southern part of the lake (970590 - one tent site) and noticed a surveyors pin dated 1947. I was going to turn back at this point as I was very aware of the need for me to get back upstream and uphill but I couldn’t resist paddling to Holman Lake which connects to the Churchill River. I paddled to the north end of this lake and found the portage from the small, nameless lake to Holman Lake on the river right side of the outlet stream. It was in generally good condition but would benefit from some chainsaw work. There was a campsite for one tent high on the river left side of the outlet stream and it appeared that it would be possible to camp along the portage trail. 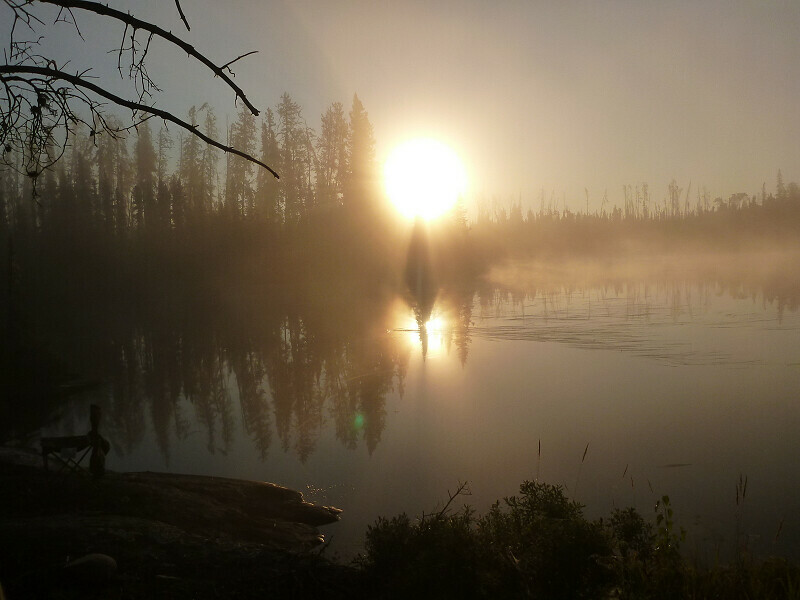 After walking to the Holman Lake end of the portage and taking a picture, I started my return journey. View from the end of the portage trail looking out to Holman Lake. I paddled to “Surveyor’s Point”, took a picture of the marker and then started out. It was about 1:30 p.m. The return trip was much easier because I knew what to expect and where to go because of the flagging of the dragging trails. I was back at my campsite at 4:30 p.m.
After washing and eating, I sat around for a while then went to lay down. During the night it started to rain and it rained off and on all night. When I got up I looked at the weather and wondered what I should do. The rain, wind and approximately 5 degree temperature didn’t make going back with chainsaw to cut portage trails seem all that attractive. I was planning to go out the next day anyway so I decided I might as well pack up and leave. It rained and the wind blew (mostly headwinds, of course) all the way back to my vehicle at MacKay Lake but, since I knew where to portage around the rapids on the creek, it was not too bad. I was back at my vehicle at 3:00 p.m. and in Missinipe by about 4:00 p.m. Ric and I enjoyed a beverage while I gave him trip report. I stayed in Missinipe for the night and went home the next day. I stopped at a temporary Marine Inspection Station in Alberta (not knowing if I was technically a boat or not.) They were educating boaters of all stripes about the need to clean and dry our boats to stop the spread of invasive species, specifically, Zebra Mussels, Quagga Clams and Eurasian Milfoil. Anyway, a good trip and another way to access the Churchill River. Maybe someone can find the “main” portage trail and the trails around the 3 rapids on the creek below the falls. Fantastic work Ralph! Thanks for your efforts in cleaning up and re-establishing additional routes. I find it rather surprising that this route should be easier than the Devil portages. I have in the past seriously considered a trip starting at MacKay and seeing where I could get. However, that sort of trip keeps losing out to easier options. p.s. Mark April 25, 2015 in your calendar - that's when we've booked the 2nd annual Saskatchewan Paddling Symposium! Nice report and pictures - your trail clearing efforts are much appreciated. I had coffee Sunday morning in Missinipe with the other Edsonians, and some wandering Hintonians, before they set out to work at clearing the big loop out of MacLennan. I was wondering - the year before when you went to Thornton, did you do any investigating of the route north from there via Kavanagh to Nipew, as described (in reverse) at the end of documented route #37? You are welcome - somehow, it doesn't seem quite like work. Bryan - I, too, find it interesting that the local family considered this way easier. That's what makes me wonder if I have not located their trail and their portages around the shallow rapid sections. jmc - Ric had asked us to clear the long portage between Bartlett and Thornton but we didn't go further - the 2K portage was not all that attractive and we had trails in the Provincial Park that needed attention. He did say that several groups had gone through that way this year and they had commented that the portages further north could use some attention from a chainsaw. So, the Edson/Hinton people are going up to MacLennan Lake. Although this was one of the options under consideration they were leaning toward doing a loop out of Nemeiben Lake when they left. It's all good. I'm sure they'll have fun. FYI, I saw 3 otters just as I left Heyer Bay on MacKay Lake and I saw a marten hopping down the portage between MacKay and Bartlett. Also, the usual bald eagles as well as the thousands of migrating snow geese, white-fronted geese, Canada geese and Sandhill cranes. Finding 'new' routes or reestablishing old ones is always worthwhile but not necessarily easy. 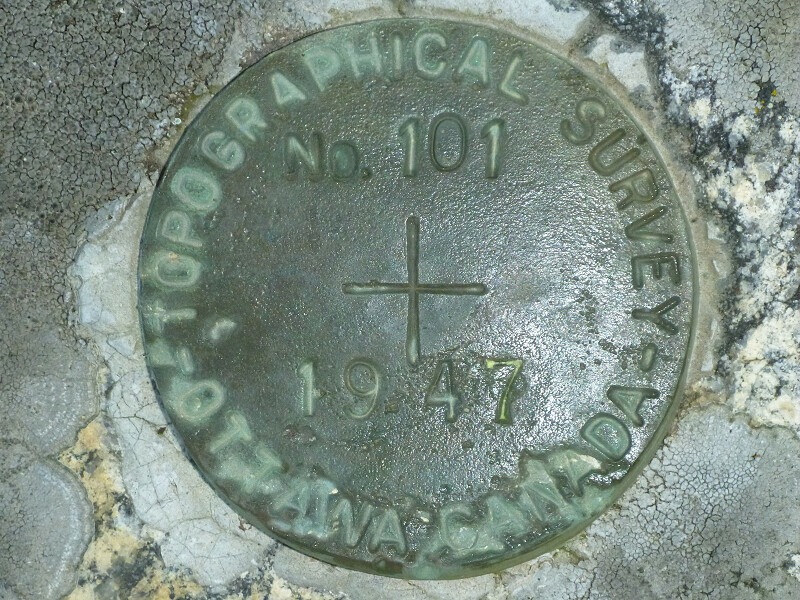 The survey marker of course means that others have gone that way or passed by before. All the more reason to reestablish the route. Best wishes to finding the elusive trails. A chainsaw always comes in handy for major portage clearing. I ran into them a few years ago at MacKay in the winter when we were camped near the portage into Bartlett and they were heading into Bartlett. They travel this area and beyond by dogsled, at least. I would bet that if anyone knows the details of the route you are after, it is them. I thought I had a map somewhere that showed some portages in the MacKay and Bartlett Lakes area, perhaps just into Welk Lake and such, but perhaps beyond Bartlett as well. I'll have to search for that. Edit to add: I bet the "beyond Bartlett" portion I am thinking of is route 37 that jmc mentions. I'm not familiar with Miriam and Quincy from Paws and Paddles but I'll contact them to see if they have more information about the portages. 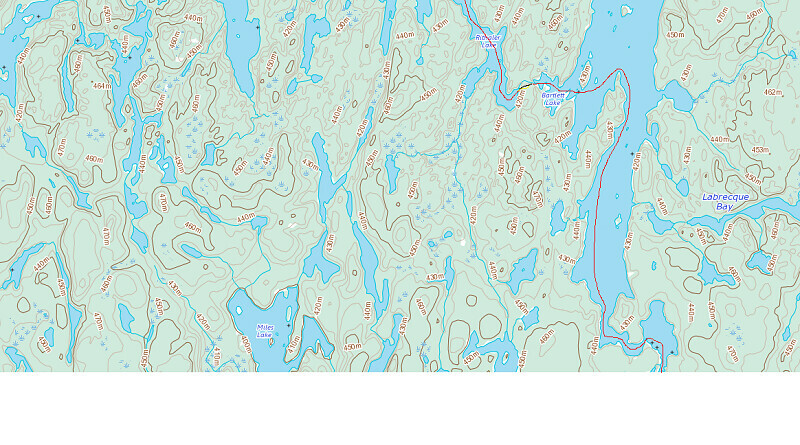 If you can find your old map, it would be interesting to see what portages are in that area. Let me know what you find. Keep the Saskatchewan reports coming. 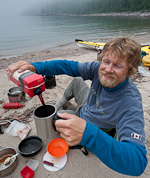 I love reading about canoeing in northern Saskatchewan - very intriguing for a guy from Ontario. Hopefully I'll make it up that way soon!